Opponents of human embryo research have understandably welcomed pluripotent stem cells being derived from body cells including cells from umbilical cords after childbirth. The cord would otherwise be discarded and embryos are not destroyed. However, there are other ethical, legal and political issues in cord blood collection, whether for the child’s future use, or a public blood bank. Information and consent procedures may be misleading. Some parents have false hopes about potential outcomes. The right of access to stored blood and other benefits is sometimes uncertain for children and their families. Private stem cell repositories may compete with public ones. People may want to impose conditions on donation. Quality control may be an issue. Umbilical cord blood is a valuable source of haematopoietic stem cells. There is little information about whether religious affiliations have any bearing on attitudes to and decisions about its collection, donation and storage. The authors provided information about umbilical cord blood banking to expert commentators from six major world religions (Catholicism, Anglicanism, Islam, Judaism, Hinduism and Buddhism) and asked them to address a specific set of questions in a commentary. The commentaries suggest there is considerable support for umbilical cord blood banking in these religions. Four commentaries provide moral grounds for favouring public donation over private storage. None attach any particular religious significance to the umbilical cord or to the blood within it, nor place restrictions on the ethnicity or religion of donors and recipients. Views on ownership of umbilical cord blood vary. The authors offer a series of general points for those who seek a better understanding of religious perspectives on umbilical cord blood banking. Umbilical cord blood is a source of haematopoietic progenitor cells, which are used to treat a range of malignant, genetic, metabolic and immune disorders. Until recently, cord blood was either collected through donations to publicly funded cord blood banks for use in allogeneic transplantation, or stored in commercial cord blood banks for use in autologous transplantation. The line between public and private cord blood banking is being blurred by the emergence of “hybrid” models that combine aspects of both the public and private systems. The authors describe these hybrid models and argue that their emergence is explained by both market forces and public sector policy. They propose that the future of the sector will depend heavily on several key developments that will differentially affect public, private and hybrid banking models. While direction of donated tissue to family members has long been accepted, direction to members of specific racial groups has been opposed, on the basis that it is discriminatory and contrary to the ethos the institution of organ donation seeks to promote. It has, however, recently been proposed that racially conditional donation may provide a useful – and ethically acceptable – way to address the social inequalities and injustices experienced by certain cultural groups. This article examines the ethical, legal and cultural arguments for and against racially conditional donation, concluding that the practice is more likely to undermine the values of equity and justice than to promote them and that it may also lead to other unfavourable personal and social outcomes. Internationally networked umbilical cord blood banks hold great promise for better clinical outcomes, but also raise a host of potential ethical and legal concerns. There is now significant accumulated experience in Australia and overseas with regard to the establishment of human genetic research databases and tissue collections, popularly known as “biobanks”. For example, clear lessons emerge from the controversies that surrounded, stalled or derailed the establishment of some early biobanks, such as Iceland’s deCODE, Autogen’s Tonga database, a proposed biobank in Newfoundland, Canada, and the proposed Taiwan biobank. More recent efforts in the United Kingdom, Japan, Quebec and Tasmania have been relatively more successful in generating public support, recognising the critical need for openness and transparency, and ample public education and debate, in order to build community acceptance and legitimacy. Strong attention must be paid to ensuring that other concerns – about privacy, discrimination, informed consent, governance, security, commercial fairness and financial probity – are addressed in structural terms and monitored thereafter, in order to maintain public confidence and avoid a backlash that inevitably would imperil such research. Once lost, credibility is very difficult to restore. The role of law in managing public health challenges such as influenza pandemics poses special challenges. This article reviews Australian plans in the context of the H1N1 09 experience to assess whether risk management was facilitated or inhibited by the “number” of levels or phases of management, the degree of prescriptive detail for particular phases, the number of plans, the clarity of the relationship between them, and the role of the media. Despite differences in the content and form of the plans at the time of the H1N1 09 emerging pandemic, the article argues that in practice, the plans proved to be responsive and robust bases for managing pandemic risks. It is suggested that this was because the plans proved to be frameworks for coordination rather than prescriptive straitjackets, to be only one component of the regulatory response, and to offer the varied tool box of possible responses, as called for by the theory of responsive regulation. Consistent with the principle of subsidiarity, it is argued that the plans did not inhibit localised responses such as selective school closures or rapid responses to selected populations such as cruise ship passengers. At the beginning of 2008, the United Kingdom Government rolled into the Counter- Terrorism Bill some controversial proposals to reform coronial inquest processes, namely clauses that would provide for “secret inquests”. The provisions were heavily criticised both inside and outside Parliament, and took a rocky passage through both the House of Commons and the House of Lords before eventually being abandoned by the government. In 2009 the government again tried to introduce “secret inquests” with the Coroners and Justice Bill, instead ultimately succeeding in establishing what critics have termed a “parallel” system of justice through provisions around “secret inquiries”. This move has been seen as subverting the principles of transparency and open justice in the investigation of contentious deaths. This article examines the government’s efforts to introduce “secret inquests” and thereafter “secret inquiries” in the context of the United Kingdom’s coronial law and purpose, human rights obligations and the ongoing issues around sensitive intelligence, and examines the clash of laws that gave rise to the controversial proposals. Mental injury has been differentiated from physical injury since its entry into Australian tort law, with mental injury consistently subject to the most onerous regime. In 2002 in its Review of the Law of Negligence, the Ipp Panel supported the historic distinction between physical and mental injury and recommended further (restrictive) changes to the common law rules in relation to mental injury. 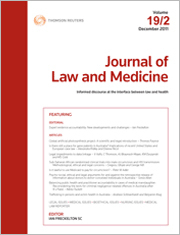 This article considers and evaluates the reforms which were introduced into six Australian jurisdictions in relation to mental injury in the tort of negligence in response to the Ipp Panel’s recommendations arguing that the rationale for differentiating pure mental injury from physical injury and consequential mental injury is nebulous. It argues that the reforms operate to reinforce and magnify historic distinctions between physical and mental harm despite increasing recognition in the medical literature of the interrelationship between physical and psychiatric injury; despite the recognition of the professional ability of psychiatrists and psychologists to accurately pinpoint and diagnose mental injury; despite extensive documentation of the far-reaching and devastating impact that psychiatric injury has on victims, families and the community; and despite evidence that early and adequate treatment of mental injury can prevent a raft of damaging and costly personal and societal consequences. This article counters arguments made by Bartels and Otlowski in 2010 regarding euthanasia. It suggests that the authors over-emphasised the importance of individual autonomy in its bearing on the euthanasia debate. Drawing on literature concerning elder abuse as well as the “mercy-killing” cases reviewed by Bartels and Otlowski, the article contends that legalising euthanasia may increase the risk that some patients are pressured, inadvertently or deliberately, to request access. Safeguards to detect and deter pressure may be of limited effectiveness against such pressure. Regarding slippery slope arguments, the article discusses the potential for an Australian euthanasia system to eventually be extended in scope to encompass mental suffering. The article encourages consideration of long-term potentialities, including changes in macro-economic conditions. Responsiveness to the chlorhexidine epidural tragedy: A mental block? For the pdf version of the table of contents, click here: JLM Vol 19 Pt 3 Contents.